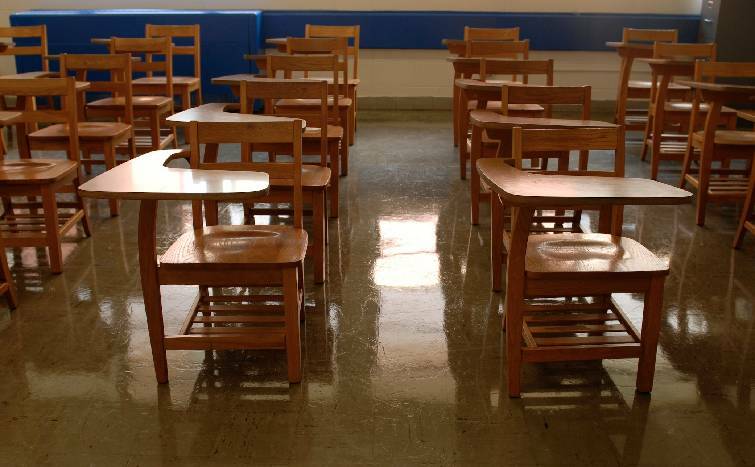 Classes in a small, financially struggling school district in northern Tennessee have been canceled until officials can find a way to generate more revenue. Clay County Director of Schools Jerry Strong said the school board made the decision Thursday night after struggling with budget concerns for three years. He said the district doesn't have enough money to pay for partially unfunded government mandates. "Clay County's inability to generate the revenue to offset the mandates is what's caused this to come to a head," he said. "The straw that broke the camel's back was really the Affordable Care Act for us and it has made it very difficult for us to have our employees properly covered and meet the mandates of the law. That was going to require new revenue and the commission felt like they couldn't do that through a tax increase." Strong said the county commission, which funds the schools, has declined to increase property taxes and a proposed wheel tax referendum vote won't take place until March. State Education Department spokeswoman Ashley Ball said Tennessee districts have on rare occasions gone past Oct. 1 without passing budgets in the past but have sorted things out quickly. She said the pressure of students missing school and staff not being paid tends to lead toward resolution. Each district is legally required to provide 180 days of instruction each year, and those days are tacked on at the end of the year just like days lost to bad weather, Ball said. County Commissioner Parrish Wright contends that the district does have enough funding to get through the end of the school year and officials could take up the issue later if the tax referendum doesn't pass. "It's going to hurt a lot of people," Wright said about the decision to shut down the county's three schools. With children at home, parents will have to find child care or stay home from work. "Either way it goes, Clay County has lost. Nobody's won." Strong, however, said the district will be financially in the hole at year's end, without more revenue. He said school officials feel like the issue needs to be dealt with immediately. "The choice was to either close schools and deal with this now or keep schools open and spend ourselves until we have nothing in our fund balance at all," he said. Strong said he hopes classes for the 1,150 students in the district will resume sometime in November. Wright said county officials favor a wheel tax over raising property taxes to generate money for the school system. "This is a poor, rural county and we already have the seventh-highest property tax rate in the whole state of Tennessee," he said. "Our property taxes, they're high enough." Strong said school administrators are trying to set up a meeting with county officials soon to look at their options. "We just need this shutdown to be as short as possible. We need to get the kids back in school and do the jobs that we're paid to do," he said. "Then we also have to understand that we're going to have to put a value on education in Clay County." Wright said he also hopes officials can find a solution quickly. "I certainly hope we can resolve this," he said. "There has to be a middle ground."